But I have another objection to add to your frustrations. My spouse worked for the Church, which meant we had no health insurance for 21 years. We also were married for 19 yrs before we could afford to buy our first home, having lived in near sub-standard, rental housing for much of our married life. We did without, clothed our 4 children in hand-me-downs, rarely went out…you get the picture. It’s how most everyone has to live in this tough economy. And we didn’t mind sacrificing for the Church. But when it came time to send our children to Catholic colleges, there was NO financial aid to children whose father had been in ministry (and hence had no money for college). I believe that the cost of Catholic education, from Kindy through college, is an act of abject social injustice. While the “Social Justice” arm of the Church cries for higher taxes, those of us who sacrificied to raise large families on one salay are ignored. We are the ones who sacriced with the goal of passing the Faith on to our children. And yet I’ve never heard a “Social Justice” advocate, advocate for us — not once. Thank you for this article. I hear your frustration loud and clear. Our own children are all saddled with student debt from Catholic education. With my last now in college, I hope to be able to get a job just to help THEM pay off those debts. Of course, I’ll get no tax deduction for it, since the loans are in THEIR names. “Social Justice” advocates: Where’s the social justice in that? “Social Justice” advocates: Please start recognizing the needs of loyal Catholic families! Thanks for this very powerful article and replies. Perhaps it is easier to solve other people’s problems than one’s own, and in Ireland things differ so much from the US. A Catholic education does not guarantee a Catholic life, but a Catholic home is a better guarantee. It is unfair to burden yourself or your family with excessive expenses. We do our best for our children, but that does not mean we financially ruin them or anyone else. Do not worry too much, do what can be reasonably expected and with the great start they have had your children will all turn out a credit to you, themselves, their country and the Church. Yes, it’s extremely difficult for large families to give their children a Catholic higher education. Frustrating. Nevertheless, if your children attend a university with no Catholic affiliation, if they are part of a good Catholic Campus Ministry, that will greatly help to keep them on the straight and narrow of their faith journey. Fundamentally, too, I agree with noelfitz. Bottom line, the home is a very important factor in creating a good foundation for the children’s faith. You seem to have that covered. 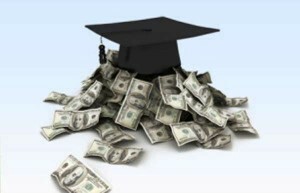 Two people have contacted me about this article and offered to share graphics that illustrate the college cost problem. Both of the them are well done, interesting, and informative. Here are the links.